3. The glorious Silver Bells project turned-out to be only a feasibility study for more functional and astonishing elaboration of the pièce de résistance, the ravishing virtual theater organs, which dream-like instruments come with lots of bells, chimes, harps, pianos. ... All culminating in the extravagant excess of the dubious third keyboard! 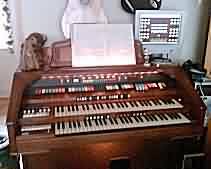 However Youtube also showed the SoloVox’s monophonic voice and large flat stop tabs “inherited” by the solo voice part of my beloved Hammond Chord Organ. ... So my life-long intermittent chord organ yearnings are clarified; although they were also inspired by playing an actual chord organ at the Hudson Guild (a neighborhood Trotskyite outpost) for as long as they’d let me. ... I can still almost recall the beautiful feeling of precious access to the wonderful controls and sounds. ForteDXI, sold by the usually-admirable PGMusic (the endearing “Band-in-a-Box” people) wasn’t really ready for prime time. It played OK, but not in my new-age 64-bit Reaper. And it couldn’t remember its settings. ... 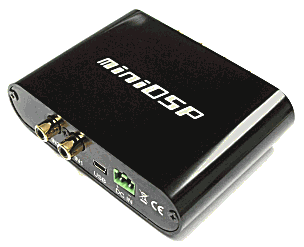 Apparently, it might work good with PGMusic’s Band-in-a-Box product, who’ll remember its settings for it, and don’t need no stinking 64 bits. ... And it’s in the now-totally-obsolete “DirectX” format — which Reaper nevertheless patronized — and it plays a proprietary sample format. ... There’s a demo which probably lasts a month, and $40 gets it; but I didn’t. And The Winner is Cakewalk’s free “SFZ Player”, which initially could only produce “Not Enough Memory” errors which as usual, translated from mumbo-jumboese, means “mumbo jumbo fault”. But the internet is awash with reports on how it plays SF2 and SFZ soundfonts, so after a few months I installed it again and it still didn’t work, but then I tried installing it on a 32-bit XP system and it did, so I googled “sfz 64 bits” and got a cakewalk forum where someone said a different more expen$ive product’d work good with the magical PR32 or PR16 “modes”, but SFZ was happy, too, when I set it that way and who knows. ... Such things may be file-dependent, at least my lovely general MIDI “Chaos_V20” produced the memory error with PR32 but worked good with PR16. Duplicating the Reaper track and selecting another voice plays two sounds at the same time! ... I thought this was a magical thing I could do with VSTSynthFont because I was confused, but I believe it’s probably the way all of us hot-shot MIDIesque types get more voices. 7. Authenticity. Wikipedia says Hauptwerk was a British guy Martin Dyde, who was then acquired by Milan Digital Audio which, of course, is based in Indianapolis, Indiana, USA. ... Hence the “cryptic” in “cryptic Teutonic omniscience” as per my beautiful chart.. ... Two other Hauptwerk highlights are the official forums — where someone else Hauptwerked his Nord C2! — and http://www.pcorgan.com/indexEN.html, where I realized that, comparatively, I’m normal. ... It’s a Dutch site on all things Hauptwerkian, and the photos are particularly impressive. 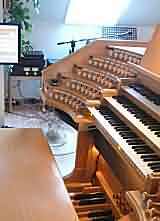 The picture is a relatively subdued Hammond — a model or so up from my late-lamented Commodore — that someone has presumably MIDIfied and Hauptwerked, but there are immensely more intricate and extravagant consoles pictured, most in Europe, mostly classical rather than theater organs. ... Where it appears there are firms who manufacture MIDIesque keyboards / consoles for the hobbyist / church Hauptwerk hordes. ... Who knew? 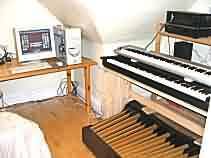 Nothing, seemingly, could be further from a tracker organ than our electronic super-keyboards, especially my beautiful Nord, but yet! — there is a common theme: smallness. ... The trackers, as well as rejecting the pneumatics / relays of “modern” (post 1850 or so) organs were also, inherently, small organs. Catch Diane Bish in one of her lovely informative videos strewn over the cable channels playing a real historic European organ — better yet, a genuine historic Ohio tracker organ — and, while the machines are hardly small and quiet, she is obviously working hard to get the keys to go, and there is an apparent limit to how many pipes can be played with one tracker key. 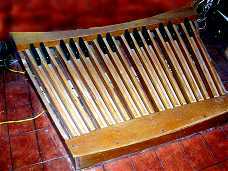 And after leaving this shameful Johannus plug here all these years I should at least depict another dubious contender, the Wersi “OAX” line of ridiculous European instruments ~ 9/15, rumored @ the glorious Organ Forum. ... And I might as well note some other priceless contenders are the splendiferous Lowrey (the only organs I’ve actually seen for sale, @ Florida Bob’s Piano & Organs) and Rodgers (recently acquired by Johannus). 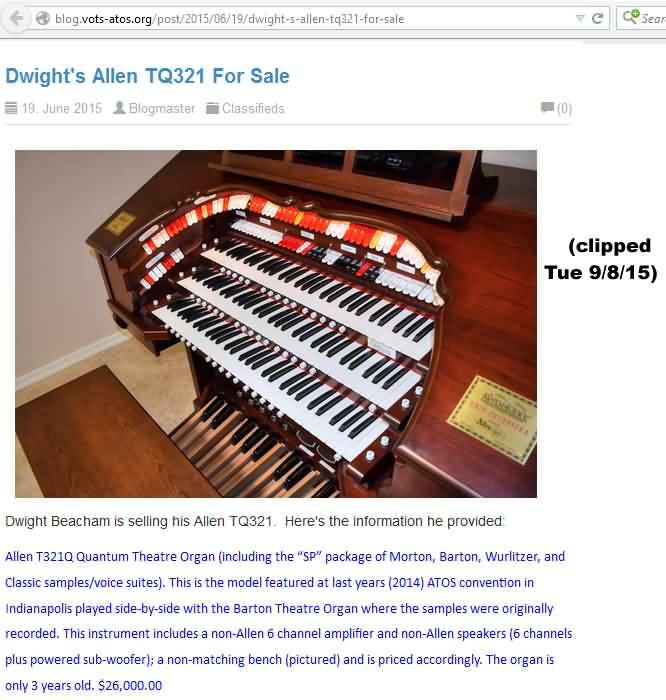 And @ 6/15, “Dwight Allen” was selling his TQ321 Allen used for $26K; Perhaps there are other Allens available at such previously-owned prices, or perhaps not. 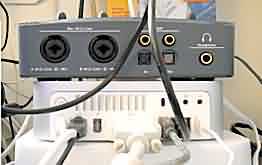 The BFD in its turn was an improvement on my previous Behringer FBQ3102 31-Band Stereo Graphic Equalizer because (1.) the BFD is cheaper, (2.) the parametric adjustment was so much more precise than the crude 1/3 octaves available on the graphic EQ and, finally, (3.) adjusting all those tiny fiddly controls on the graphic EQ is actually harder than the considerable agony involved in programming the parameters on the BFD — which also has ten presets — storage areas, so I could have one for the Nord, and one just for the Hauptwerk Paramounts. I should note that parametric EQs including the BFD are not ideal as general-purpose tone controls. 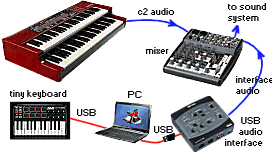 The bass / treble / mid controls on the Nord, and my mixers, are far more convenient. ... But I was raised in a progressive household and my parents, like the other intellectual beatniks, had a hi-fi with an enormous speaker. Later in life, my father was bitter, betrayed by stereo, and he played everything with cheap tape players and worse, and loudly scoffed at hi-fi pretensions. 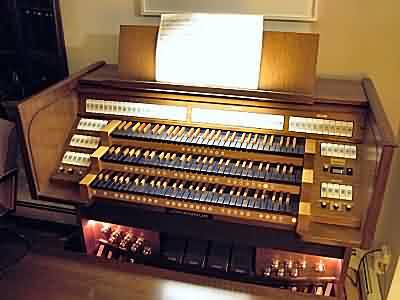 I, however, grew-up in the faith, and retain an atavistic horror of touching the tone controls. ... Hi-end stereo today is increasingly a staged evocation of my father’s and friends’ hi-fis, down to the tube technology, but they are also very negative on tone controls, except when something expensive comes with some, but most don’t. And I still tremble to touch the forbidden dials, and somehow doing it with a higher-tech gadget like the BFD isn’t nearly as troubling. ... I should be in a 12-step program. ... And then it turns out, inhibitions or not, the BFD is often a better tone control; more precise. Of course. ... But definitely less easily-adjustable. And then at last I felt that, if I was going to hook-up a hifi EQ, I might as well get back to the hard stuff, and so I did, and gloriously concluded the DSP1124P wasn’t noisy despite previous delusions. 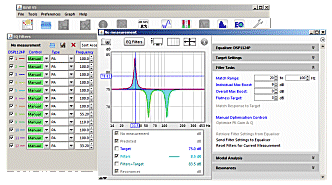 In the interim I’d improved various signal-to-noise ratios, most recently discovering the mysterious hidden (to my eyes anyway) Miditzer “Master Gain” control, but before that I’d installed clouds of HD400 gadgets. And now the DSP1124P runs again, and will crush newly discovered Nord wolf-notes and/or push a little harmless EQ here and there as I see fit, and is without blemish. At the very least, Hauptwerk’s dubious system restore prohibition implies that you will dedicate a PC to the beautiful virtual organ, which I’m sure would be meet and right so to do, but perhaps inconvenient, and costly. ... And reeks of the apparently latter-day pro-Macintosh bias exhibited by the once-Windows-only software, i.e., because Macs never go wacko. ... And always cost more. One approach to working-around Hauptwerk’s crotchets might be to somehow install the thing on an extra drive, and then I believe it is possible to exclude that drive from the restore system. But Hauptwerk for some bizarre reason won’t let me install the program anywhere but on drive c: — I say bizarre because lots of other software doesn’t have this restriction — but the “custom” installation option let me install everything else — the bulk of Hauptwerk’s vast samples and who knows what — on another drive, as I have verified. I guesstimate that the “c:\program files” Hauptwerk doesn’t have Windows-restore-averse files in it, and you can exclude a particular drive from Windows restore. So that should work perfectly! With a laptop, one would “partition” a drive out-of whatever you got, which is an intricate dangerous process and could easily destroy your equipment, if not your entire local ecosystem + beloved pets, so only the mad and the dangerous undertake it. ... When I did it on my trusty Windows 7 / 2010 laptop, first I “shrunk” the existing partition by 100 gigabytes, then I made a “simple” partition in the freed-up space, called it “drive d:”, and it was good. ... But really, this is a ridiculous amount of dangerous tinkering for mortals to go through, just so that a wacko virtual organ’ll have a chance of surviving in a restored windows system. ... And this just in: I tried restoring such a partitioned system, and it didn’t explode; Hauptwerk continued its beautiful virtual effusions. ... Conclusive random evidence! However, THE BAD NEWS is the dongle appeared to cripple the free Hauptwerk so it had an additional startup annoyance delay. ... That is, after my $250 and the intricate activation ritual, the Hauptwerk installation worked good — in my case, with the free Paramount 310 and St. Anne’s, indistinguishably from the free version — except I don’t have to press a key to clear the free/evaluation screen at startup. But removing the USB key and starting Hauptwerk, as well as restoring the free/evaluation screen, roused a new annoyance screen, which waited 30 seconds for me to plug in the dongle with a censorious air of “what are you trying to pull now?” ... Amusingly, this frolicky new screen would often get “lost” as I jiggled windows around, desperately clicking the Hauptwerk icon and “stealing” the “focus” as we computery guys might put it, so there’d be no window, just the delay. Well, anyway, the next step of our Stupidity Sweepstakes is me, the stupid user, not carefully reading the new annoyance screen, every single syllable — well, on one of those occasions when I hadn’t hysterically managed to click-away the focus — where it says right there in black and white that I could “change or disable this delay on Haupterk’s general preferences screen”. ... I never did actually manage to read that in my struggle to defeat the thing; I perused the manual where the same information is available or at least hinted-at — or I vaguely-remembered it going-by while option spelunking? — but, indeed, “General preferences” / “Advanced preferences” tab / “Maximum time to wait for Hauptwerk USB key on start-up (seconds)” was set to 30 seconds — before the dongle, it’s set to 0 seconds — and restoring it to 0 cleared the newly-hatched annoyance screen. ... So all is well, and what was I so excited about, anyway?!?! 12. After idyllic months of organizing I got to the second Orgelbuchlein chorale prelude, which cannot be played, as written, on the Nord C2’s 27-note pedal board. But Gott, Durch Deine Güte actually can be played, an octave lower with a 4’ pedal stop. Apparently the Master went through the unusual trouble of writing “Man. Princip. 8.F.” and “Ped. Tromp. 8 Fuss [foot]” on the manuscript, about which my Ditson editor makes an obscure fuss so to speak, but I think Bach was just trying to get across to himself or more likely some subordinate who might play the piece in the future, that the pedal was supposed to be a prominent part of the polyphony, and he was hardly likely to keep scribbling “or, play it 8va lower with a 4’ stop”. Although he did make the part fit that arrangement. And as the world turned and the dust settled, and the era of True Loudness commenced, the Eb crisis subsided. The Paramount 310 Eb is still weak; but not so much. Conceivably, I could’ve missed the whole thing, in its current milder incarnation, depending on how often I play I’m Getting Sentimental on the 310, and my affections have shifted in the interim back to the Miditzer. In the grand summation — well, I finally read something on the web about room effects, and my ignorance simply expands in ever larger widening waves. ... And anyway, it was probably the warts in some POW pedal notes, which other vtpoers have eventually complained about. 15. The Miditzer versus Hauptwerk hardware hookup story: if you’re planning on wiring-up one of these ambitious three- or 4-manual consoles and MIDIfying it along the way — something far beyond my hopes & dreams & competence — the MIDI-related software challenges of Miditzer versus Hauptwerk’s admirable “auto-learn” feature won’t make much difference, because the console is so much work it dwarfs the VTO configuration. 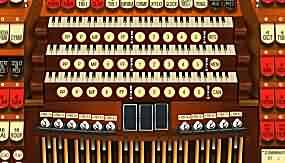 Through assiduous promotion and perhaps even merit, Hauptwerk has convinced the virtual organ enthusiast community — at the VTPO forum anyway — that it sounds better, and the console projecteer is seemingly obliged to choose — to match the engraved stop tabs to the virtual organ’s voices, at least? But I suspect the vast majority of virtual organ set-ups are not of the authentic console or MIDIfied organ flavor but just decent hacked keyboard + pedal lashups (i.e. 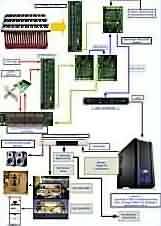 like that ), probably with a PC (as opposed to a Mac) and where you’re probably going to use the PC screen for stop/combination setup — for such, unless you’ve decided Hauptwerk sounds better, the Mitz and Hwerk are close in terms of technical agony. 16. I resisted the third keyboard with scornful indifference and mockery of the console-obsessed, but then the darkness drew me in and I contrived a pitiful shelf thing that’d prop my beautiful Nord up in the air enough to tuck-in something like an M-Audio Keystation 61ES 61-Key Semi-Weighted USB MIDI Controller ($140 amazon). I made the shelf about 2’’ too deep, and so had to perform a death-defying whole-shelf circular-saw truncation, which actually was easier than fabricating the silly thing in the first place, and involved no lost fingers! The feasibility study was conducted entirely on the Nord’s 2nd Christmas, using attractive wood from somebody’s some-assembly-required kitchen furniture found @ the curb, which I disassembled months or years ago but still retained for a project just such as this, the result being immensely enhanced by the lovely plastic real-wood finish although still obviously the work of an enthusiastic and destructive amateur — just like my organ performances! ... And I played the Nord on its new shelf, and it seemed as lovely as ever, and I got the 3rd keyboard and tried it out. ... I’ve already ranted about how this kind of tinkering can be self-defeating because of the inevitable “breakiness” it introduces into my up-to-now mildly-reliable home organ — but I was still curious how nice it would be, whether it’ll be better than without, and I’ve cunningly done the mutilation so it can be reversed without serious harm; or so I jejunely hoped. And then I got the stuff working for an hour or two. ... And I still only have two arms! ... And whatever is the Mitz 260 solo manual for? I’ve sort-of noticed previously, but now it’s obviously a lesser manual, even with its authentic Wurlitzer stop list. ... Indeed most of my combinations worked OK, even ’though I contrived them in those innocent days when the Nord swell controlled both great and solo — because the solo just duplicates some of the great stops, so I didn’t bother using any solo voices anyway . ... So I put my beloved tibia on the solo, with fluteish accompaniment, and then a handy bell or so on the great, which was nice for Toyland. ... I still play a stirring rendition of I’ll Be Home For Christmas on the accompaniment and great — but then what’s that other manual for? ... The odd chime? ... As I’ve noted repeatedly in these pages, I don’t do flashy keyboard changes, also known as “competent keyboard skills”, so that’s out. In the Hauptwerk 320 “Organ settings / stop/coupler[...] / sostenuto” somewhere in the middle of the giant list. I clicked it, and then in the configuration form on the right clicked “auto detect”, tapped my Hosa FSC latch once, then again, and then clicked “DONE” and now it works gloriously. CONCLUSIONS & EXCUSES: At $150 + the usual ridiculous unpaid labor, it was still worth it: it amuses me enough. 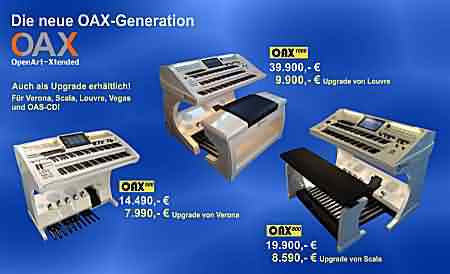 ... A “must-have” for the home electronic organ? ... I guess not. ... When the USB works, and it’s worked for months, it’s fun, but mostly for playing the odd bell in otherwise two-manual pieces — alternate right-hand lead voices seems like a likely advantage, although I can’t say it’s panned-out so well, i.e. as opposed to just poking a combination button to change the sound. 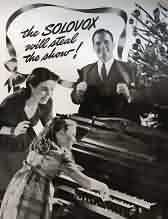 ... My finest achievement so far was rendering a slam-bang ending to Auld Lang Syne with chimes as clanging New Year’s bells on the solo while holding a closing chord on the accompaniment/pedal, + repeated smashing of the “toy counter” gong with my right foot via a Nord pedal + software trickery . ... It made quite a racket, and I was so enthusiastic I almost fell off the bench ... but is it art? AMATEURS? And then it occurred to me that, like the obviously amateur-night crescendo pedal, perhaps the third keyboard is for the organically-challenged! ... Who would use it just as I do, as a convenience feature aka “crutch” for an additional voice (or more, with more manuals) without having to figure-out the intricate combinations and/or 5 million tabs! ... The maestro would set-up a couple of combos, and then my iconic wandering piano player would use just those buttons and the manuals, changing manuals/combinations to suit for the movie action. Or it’d be combined with the crescendo, so any position of the pedal would produce a softer accompaniment, louder great, and appropriately “solo” voice, the whole group graduated in loudness at each crescendo position, so the itinerant pianist’d just “dial” the thing up as per the movie scene/section. ... 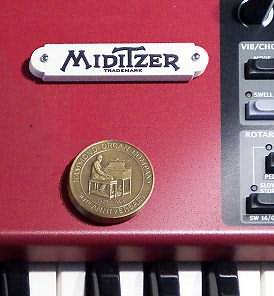 It would explain the otherwise unlikely expense — it’d work for the virtuoso for marvelous effects, but the money’d be justified by making it easier to hire cheap keyboardists for the hum-drum everyday matinées.